Varicose veins, swollen ankles, and edema can be treated with diet and exercise. There was a great TV series on the tube: House. It’s about a doctor who actually uses his brain — a modern-day Sherlock Holmes who applies logic to figure out his patient’s problems. If all doctors were like that, I wouldn’t have a problem with them. Unfortunately, House seems to represent the atypical 1 percent. Because the fact is that most doctors don’t know enough to understand simple remedies, and don’t apply enough logic to know when they make sense. Take poison oak and poison ivy, for example. A simple soap is all that’s needed to cure those. (See Curing Poison Oak and Poison Ivy.) Yet doctors are still prescribing general, systemic inhibitors like cortisone. Go figure. Another case that came to my attention recently involves swollen ankles and varicose veins. I’d seen that problem once before, when a friend had surgery on a doctor’s recommendation, before I could get to them with a nutritional solution. In this case, at least, surgery hadn’t yet been performed. Instead, the doctor advocated a low-salt diet to keep blood pressure low, and prescribed an industrial-strength medication (Lasix) to reduce it even further. As we’ll see, those recommendations aren’t great, for other reasons. But the story gets really interesting when the doctor was told that the combination of the medication and running made things better, but running by itself didn’t, and the medication by itself didn’t help, either. Upon being informed, the doctor replied that he didn’t know why it was working but, as long as it was working, “you should keep on doing it”. As you’ll see in a few moments, that advice is dangerously counterproductive. Worse, it’s based on ignorance. Worse still, all the information needed to understand the problem and devise an effective remedy was at the doctor’s disposal. All the doctor had to do was apply a little logic. The doctor got the information needed to understand the problem in medical school. It stems from an understanding of how veins work. Most of us know that the blood gets out to the extremities because the heart pumps it there. It supplies the pressure that moves the blood through our arteries. But most of us are unaware of how it gets back — especially from the legs and feet, where it is working against gravity. The veins accomplish that minor miracle using a series of valves. Blood is squeezed through the valve, after which the valve closes so it can’t drop back down again. That blood is then squeezed through the next valve as more comes up from below. To imagine how that process works, first think of a series of pipes. In this picture, the pipes have strong walls and strong valves. In that situation, blood pumped by the heart in the arteries pushes against the blood in the veins, and everything moves along smoothly. In reality, though, veins aren’t pipes. They’re more like balloons. The degree to which they stretch determines how well the valves work. If they stretch too much, nothing is forced upwards. The fluids just sit there, collecting in little puddles. Voila. You have edema, also known as swelling. In other words, you get swollen ankles. Strong muscles help to shore up veins, which makes the valves work better. And as muscular contractions squeeze the veins, they help to move the blood. That’s why exercises like running tend to help the problem. But when you’re running hard, you pump just as much blood into the legs as you squeeze out of them, so there is no net gain. That’s where the “blood pressure medication” comes in. The medication reduced blood pressure so that the heart wasn’t pushing as much blood into the system. 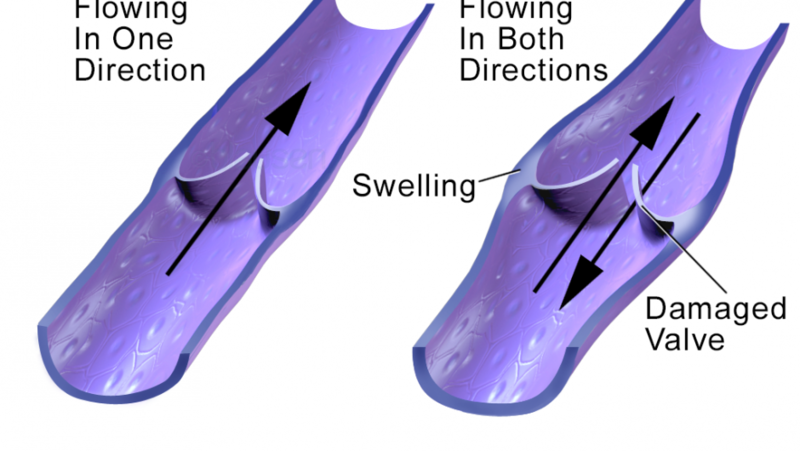 The muscular contractions, meanwhile, were squeezing blood out of the veins, so the overall effect was to temporarily reduce the amount of fluid accumulating in the ankles and lower legs. This was a seasoned runner who, when running easily, barely gets above her resting heart rate. So running easily on low blood pressure medication worked for her. It probably wouldn’t work for everyone. Possibly the most important point, though, is that nowhere in any of the doctor’s recommendations is there any hope for a real cure. The medication, had it worked, would only provide a temporarysolution. Stop taking the medicine, and the problem returns. That’s not a cure. That’s symptom management. Similarly, advice to lower salt intake addresses the symptom without addressing the real problem — veins that are insufficiently stiff to do their job properly. Like a wall made of plaster, without the wooden framework to provide strength, it collapses instead of holding up its weight. Even medication and running together, while effective for controlling the symptom, were not addressing the real cause. And whatever benefits the medication provided were offset by the problems of chronically low blood pressure it brought on, making normal activity all bu impossible. And that, at bottom, may be the real problem with the way medicine is commonly practiced. All too often it settles for decreasing symptoms, instead of penetrating to an understanding of the real problem, and addressing it — even when the information is available to understand the problem, and all that’s required to put it together is a little simple logic! The remedies for varicose veins, edema, and swollen ankles involve exercise, body work, and the right nutrients. It’s the nutrients the address the underlying cause of the problem. They provide the building blocks the body needs to build strong scaffolding — the framework that gives strength to arterial walls and the walls of the veins. The exercises, meanwhile, act to control the symptoms in the meantime. They also put the nutrients to work in the right way, because the body builds most in those areas that are being exercised most heavily. So diet and exercise both play a role — but it’s the right kind of diet, and the right kind of exercise. Calf raises can be done throughout the day. As you go up on your toes, the calf muscles squeeze the blood through the veins. It’s really hard to work the calves enough to make them grow, so there’s no danger of overdoing it. But if you’re not used to it, your muscles may get sore, at first — so build up slowly until soreness is no longer a problem. Alternating calf/thigh squeezes can be done anywhere, but are most easily performed when lying down. The first time I tried this, I found that I could squeeze my upper leg muscles easily, but I had hard time “finding” my calf muscles. It came quickly with a little practice, however. Inverting yourself so your legs are above your head also reduces swelling, improving the symptoms. It’s worth doing for that reason, and because it gets blood to the thyroid gland in the neck, as well, which helps to improve energy. But simply being upside down doesn’t strengthen the walls of the veins or the surrounding muscles, so it doesn’t address the underlying cause of the problem. When you get MSM lotion, make sure that MSM is the first or second ingredient. (My favorite lotions have aloe vera as the other major ingredient.) There are some lotions that say “MSM” on the label, but it’s the 10th ingredient. Those are useless. Coconut oil massage: The fatty acids in coconut oil are absorbed by the cells and used for energy, so things just naturally heal faster. The key to treating the cause of varicose veins, edema, and swollen ankles lies in taking in the right nutrients. With the right building blocks, the body can heal most any problem it faces. Without them, it’s like a soldier without ammunition. It has all the training and desire in the world, but there just isn’t much it can do. For more on that subject, see: Why Nutritional Healing is Effective. For an explanation of the amounts, why they’re needed, and why you’re not getting them from the American food supply, see “Macro Nutrient” Supplements and Mineral Supplements. The information I have suggests that a deficiency in one or more of these minerals could play a role in the development varicose veins. The relationships are somewhat conjectural, though. I can’t make a clear-cut case for the value of supplementing these minerals, so I’ll give you the information I have, cite my sources, and let you make your own judgements. Manganese: (Colgan, p.201) Manganese is needed to form bone and cartilage. If whole grains and black tea are a regular part of your diet, you may be getting enough. Otherwise. 2-5 milligrams per day may help (2 milligrams per 100 lbs of body weight). Zinc: (Colgan, p. 200) Zinc is needed create the testosterone needed to build muscle, to metabolize fats, and to metabolism iron. Take 15 milligrams per day per 100 lbs of body weight. (It begins to become toxic at 500 mg/day.) See Mineral Supplements for more information. Colgan, Michael. Optimal Sports Nutrition: Your Competitive Edge. Advanced Research Press, New York, 1993.